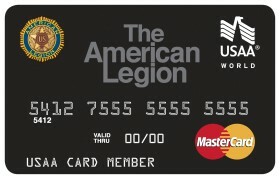 The American Legion MasterCard issued by USAA bank offers an introductory 0% APR on purchases for the first 12 billing cycles after a new credit card account is opened. Members who enroll in the MasterCard rewards program get 2,500 bonus points after their first purchase and one point for every dollar in purchases, which can be redeemed online at usaa.com. Members who enroll in the MasterCard cash rewards option receive a generous 1.25% cash back rebate on almost all their purchases. The points have no limit on the amount they earn and no expiration date. Cardholders support what The American Legion represents, because with each eligible purchase, USAA Bank makes a contribution to American Legion programs that focus on veterans’ rights issues and their quality of life. To be eligible for the American Legion MasterCard a person has to be currently on active duty, serving the United States honorably, anywhere in the world, or have served honorably during any of the eligible war eras. Besides the rewards MasterCard, USAA bank offers other choices of an American Express credit card, Visa credit card, Military Affiliate Card, Secured Cards and Rate Advantage Card (6.90% APR but no rewards). Redeeming the rewards for cash only gives members $1 for every 100 points after 20,000 points. The table below illustrates payouts for under 20,000 points. For travel though, the points can be redeemed at full point value of $1 for every 100 points. USAA bank has earned an outstanding reputation for customer service with glowing reviews and awards from sources such as Forrester Research, the Tablet Banking Report, BAI’s Mobile Link Award, the Temkin Customer Service Ratings. In addition USAA bank’s Member Community features an intimate and lively forum where members can have their voices heard and questions answered in a friendly manner. 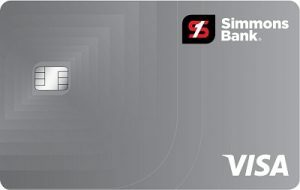 The Iberia Bank Classic Visa Card offers no rewards or cash back features, but the cardholder pays a very affordable 7.25% APR for applicants with an excellent credit history, while those having lower credit scores would pay still reasonable rates of 10.25% or 13.25% APR. The Iberia Bank Classic Visa does not charge cardholders any annual fee. The card best serves people who decide to finance their purchases over time at rates usually lower than personal loans usually offer. In addition there are no application fees and the cardholder holder names his or her own time frame for repayment of the loan. Apply here for the classic Iberia Bank credit card for further details. In additional Iberia offers an introductory 1.99% balance transfer APR for 6 months on opening an account (a 2% balance transfer fee applies). The grace period of 25 days is generous, which means you are entitled to try before you pay depending on the retailer’s policy of restocking fees and/or return policies. The Chase Sapphire card rewards and pampers its members. With 24/7 direct access to expert service advisors and unparalleled concierge amenities, Chase Sapphire card members receive world-class service and attention with no annual fee. As an opening reward, new members earn 25,000 bonus points, which is equivalent to $250 in rewards after they spend $3,000 in first 3 months. Cardholders receive 2% rewards on dining and 1% rewards on all other qualified purchases using the Chase Sapphire card. With as few as 2,500 points, you can redeem for gift cards to all your favorite retailers, including The Home Depot, Macy’s, Banana Republic and Pottery Barn. Plus, choose from a great selection of restaurants, including Morton’s The Steakhouse, Starbucks Coffee and more. Browse a huge selection of merchandise at Ultimate Rewards, including music, movies, games, electronics, kitchenware and more. Earn up to 10 bonus points for every dollar spent shopping online at the Ultimate Rewards Mall using the Chase Sapphire card. Enjoy direct access to over 370 online retailers. If they wish, members can redeem their points as cash with a very low minimum of $20. Apply here for the Chase Sapphire program.